Milltech Engineering was born in August of 1978. One man, Peter Humphries took one machine and formed Milltech. Milltech Engineering has grown into a family business consisting of Peter’s two sons, Neil and Colin now also part of the business. Milltech now has a manufacturing staff of 14 employees, each of which have helped to contribute to the culture of the company. As a family-owned business, customers can always be assured of receiving good service and personal attention. “Milltech has made some very promising contacts with the international market and is currently exporting to Australia, America, Canada and growing number of African Countries. "We are very excited about entering the international export market and will continue to guarantee top-class mlling and turning service and most importantly top quality products" says Peter Humphries. Milltech is very proud of its broad range of products, from grader wear parts to gears to tandem housings. All our products are manufactured to stringent specifications set out by the OEM’s (Original Equipment Manufacturer). 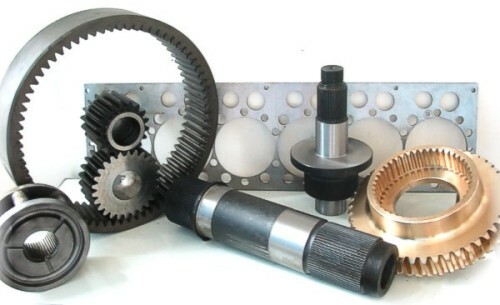 Our team of mlling and turning specialists not only specialise in spares for motorgrader machines, but we also have a wide range of spare parts for other machines in stock. Our aim is to provide products that are right the first time, thus ensuring that our customers experience minimal downtime. Milltech prides itself on their ability to build open and honest relationships with each and every one of its customers. Milltech and its directors believe in this very strongly as it opens communication and prevents problems from occurring. Milltech makes itself available during crises’ and breakdowns, providing excellent lead times and advice. We have the ability (when possible) to manufacture a part from a sample or a drawing, ensuring our customers greater flexibility and a broader range. Each part is carefully manufactured by our well trained and skilled milling and turning specialists. Care is taken during each part of the manufacturing process to ensure that the end product is of the high standard and quality that Milltech strives for. We have implemented a buffer stock level on our faster moving products, providing our customers with more efficient delivery times.